One of the sets I have been casually working on is 2013 Leaf Perfect Game. Why there are unlicensed cards made of high school students, I do not know. But since the cards are out there, they make for an interesting novelty item to get signed. 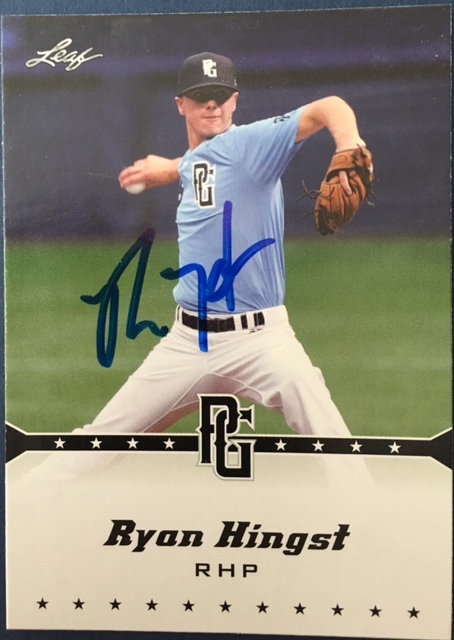 Earlier this month, I got Arizona State sophomore Ryan Hingst to autograph his card. 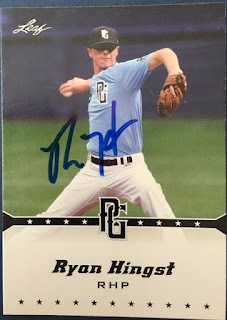 This morning, I read that Hingst threw a no-hitter the night prior against Utah. The start also happened to be Hingst's first of the season and the no-no was the 10th in Arizona State history. 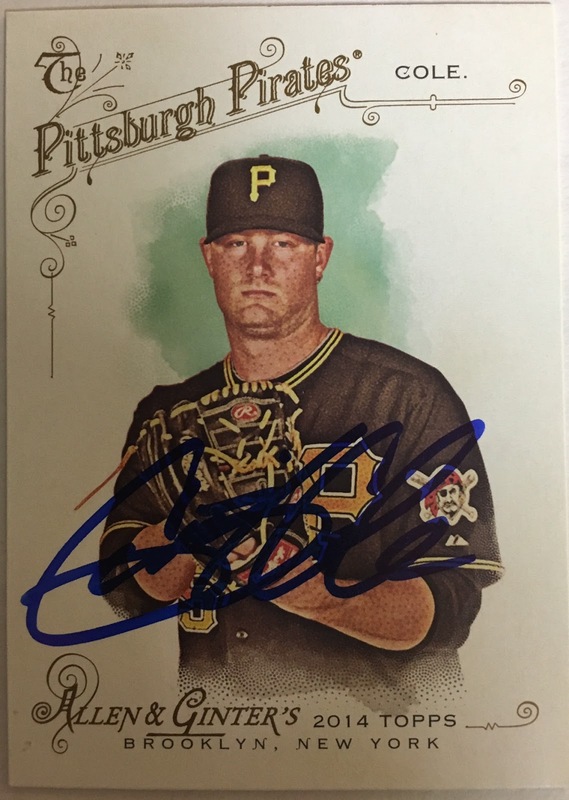 This post is a couple of months late, but I was able to get Gerrit Cole's autograph at the UCLA Alumni Game in January. In the past, it has been a mob scene trying to get his signature, but this year's event was on the same day as Dodgers FanFest, so things were noticeably more subdued. As the Pirates have black tops, I wondered if his autograph would show through on the card, but my fears were unfounded as the card turned out great. Odd to say the least that Kris Bryant cards were essentially in the dime box, but who am I to argue? The real question though is if anyone knows who is pictured on the JP Crawford card? I've watched JP since he was a freshman in High School and he bats left-handed and sports lots of tattoos. The batter in this card is a righty who is inkless. Any ideas? Universally regarded as some of the nicest inserts made by Topps in recent years. More cards like these please Topps. I have a soft spot for mascot cards, and only knew of the Opening Day Mascot cards. When I saw mascots in another insert set, I had to get them. Never had heard of these before, but after doing some research, these were apparently part of a one-week promotion that ran in Hobby Shops. If I had known this earlier, I would've snatched them all up. Another Topps Wrapper Redemption, these are nice looking cards in person. Would probably be nicer if I didn't drop them on the ground dinging the top left corner on most of them. Oh well, these things happen. This Rolen is probably my favorite card from the show. It's a 90's numbered insert, when something numbered to 1997 was considered low. But the card features everything that made the 90's maddening. A needless sub-brand (Donruss Preferred anyone?) die-cut for careful handling in your penny sleeve, with a ridiculous insert name (Title Waves?) that has a holo effect. What more could you want? To me, these were the best finds of the day. These Ultra Platinum Medallion's were impossible to find back in the day. I always liked this set as the Gold parallels featured a different photo than the base card. Sometimes it's not that hard to think outside the box and still make a quality product. Another parallel set from the 90's. I don't think they were ever worth that much, but tell that to a team collector trying to find these before there was the internet. The dealer also had football and basketball cards, and I did pick up a few of those as well. When it was all said and done, I had 224 new cards for an Andrew Jackson. Not too bad if I do say so myself. With the first selection in today's MLB Draft, the Arizona Diamondbacks selected Vanderbilt shortstop Dansby Swanson. Swanson was one of three Commodores selected in the first round, joining teammates Carson Fulmer and Walker Buehler. I was able to get Swanson's signature when Vanderbilt made a March trip to UCLA. UCLA's Friday night starter the past two seasons, James Kaprielian combined with David Berg on what is to believed to be UCLA's first recorded no-hitter last Friday night, a 1-0, 10-inning win against Arizona. I had planned to attend the game in person, but a late start time combined with the rare threat of rain in the Southland kept me at home in front of the television. To my chagrin, I missed out on Bruin history. Below is his 2015 UCLA team card, signed after Saturday's game. 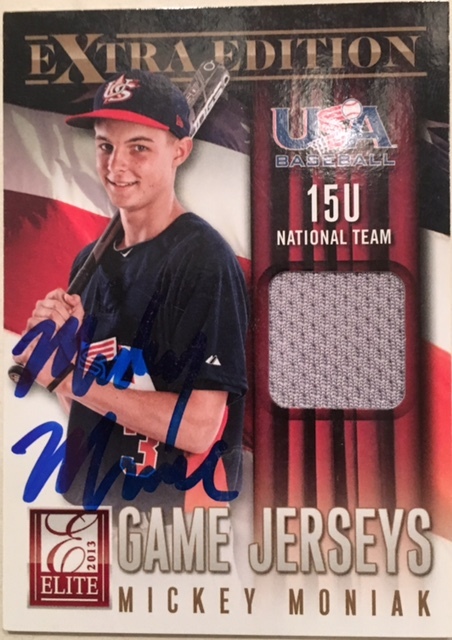 In keeping up with the Team USA theme, I had James sign his Team USA cards at the UCLA Alumni Game in January. A relative unknown at the start of the college baseball season, Dillon Tate has rocketed up the draft boards and is now generally regarded as a surefire Top 5 selection in the upcoming June draft. Tate is currently a junior at UC Santa Barbara, and being in the Big West Conference, was sure to make an appearance at Long Beach State or Cal State Fullerton this year. 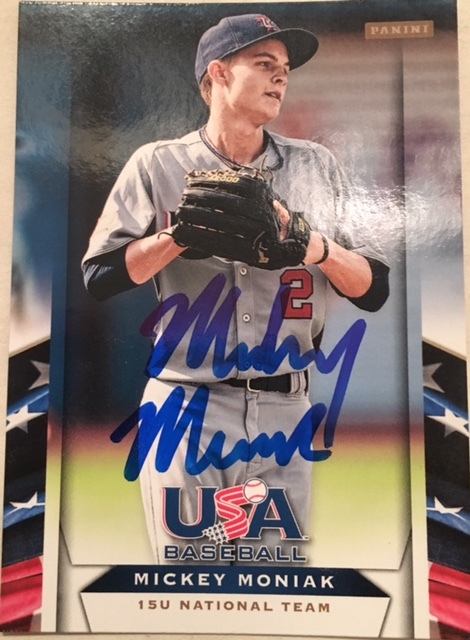 I had long ago marked this weekend down as the date when I could hopefully get him to sign my 2 USA cards. I made the trek postgame after the Fullerton/UCSB contest last night and after what was probably a 40 minute wait, Tate happily signed for everyone who asked. Since the release of the 2014 USA box set, Panini has also come out with a USA Stars & Stripes set. I was able to pick up the Tate base card from that set as well, which I also got signed.